The de novo design of peptides and proteins has recently surfaced as an approach for investigating protein structure and function. This approach vitally tests our knowledge of protein folding and function, while also laying the groundwork for the fabrication of proteins with properties not precedented in nature. The success of these studies relies heavily on the ability to design relatively short peptides that can espouse stable secondary structures. To this end, substitution with α, β-dehydroamino acids, especially α, β-dehydrophenylalanine (ΔPhe) comes in use for spawning well-defined structural motifs. Introduction of ΔPhe induces β-bends in small and 310-helices in longer peptide sequences. The present report is an investigation of the effect of incorporating two glycines in the middle of a ΔPhe containing undecapeptide. A de novo designed undecapeptide, Ac-Gly1-Ala2-ΔPhe3-Leu4-Gly5-ΔPhe6-Leu7-Gly8-ΔPhe9-Ala10-Gly11-NH2, was synthesized and characterized using X-ray diffraction and Circular Dichroism spectroscopic methods. Crystallographic studies suggest that, despite the presence of L-amino acid (L-Ala and L-Leu) residues in the middle of the sequence, the peptide adopts a 310-helical conformation of ambidextrous screw sense, one of them a left-handed (A) and the other a right-handed (B) 310-helix with A and B being antiparallel to each other. However, CD studies reveal that the undecapeptide exclusively adopts a right-handed 310-helical conformation. In the crystal packing, three different interhelical interfaces, Leu-Leu, Gly-Gly and ΔPhe-ΔPhe are observed between the helices A and B. A network of C-H...O hydrogen bonds are observed at ΔPhe-ΔPhe and Gly-Gly interhelical interfaces. An important feature observed is the occurrence of glycine zipper motif at Gly-Gly interface. At this interface, the geometric pattern of interhelical interactions seems to resemble those observed between helices in transmembrane (TM) proteins. The present design strategy can thus be exploited in future work on de novo design of helical bundles of higher order and compaction utilizing ΔPhe residues along with GXXG motif. De novo protein design endeavors to construct novel polypeptide sequences that fold into well-defined secondary and tertiary structures resembling those found in native proteins. Many de novo design strategies have relied on the known penchants of protein amino acids to espouse various secondary structures leading to several remarkable achievements [1–4]. Alternatively, the amalgamation of conformationally restricted, non-protein amino acids by chemical synthesis has led to triumphant designs of secondary and super secondary structures that mimic proteins [5, 6]. In this regard, the ability of α, β-dehydrophenylalanine (ΔPhe) to induce β-bends in small and 310-helices in longer peptide sequences has been well studied [7–18]. The presence of dehydroresidues in peptides confers altered bioactivity as well as increased resistance to enzymatic degradation . Recently designed super secondary structures such as ΔPhe zippers and helical hairpins highlight the potential of ΔPhe to introduce long-range interactions in peptides and it has been noted that the geometry of a 310-helix brings ΔPhe residues at i and i+3 position into a stacking arrangement and the structurally planar ΔPhe side-chains interdigitate to assist the cooperative recognition of helices [5, 17, 20]. In proteins, there is a wide interplay of weak non-covalent interactions between secondary structural elements, to achieve stability and overall compaction. In this context, in transmembrane proteins it is observed that glycine residues promotes close approach of helices, which permits not only favourable vander Waals interactions of surrounding side chains, but also in many cases, encourage interhelical Cα-H...O hydrogen bonds [21–25]. Interestingly, it has been found that the GXXXG motif elicits a level of self-association in putative transmembrane helices and the three-residue spacing between both glycines proves to be optimal for the interaction. In an attempt to mimic similar interactions and geometric features, we designed and synthesized an undecapeptide, Ac-Gly1-Ala2-ΔPhe3-Leu4-Gly5-ΔPhe6-Leu7-Gly8-ΔPhe9-Ala10-Gly11-NH2. Its structural features were characterized using X-ray diffraction and Circular Dichroism spectroscopy. ΔPhe residues and glycine residues as GXXG motif were at a two-residue spacer to give rise to a 310-helical conformation. Thus the peptide incorporates two GXXG like motif (Gly5-ΔPhe6-Leu7-Gly8 and Gly8-ΔPhe9 Ala10-Gly11) motif in the helix region and one GXXXG (Gly1-Ala2-ΔPhe3-Leu4-Gly5) motif near the N-terminus. The bulky leucine residues were placed in middle of the helical segment to ensure that the peptide folds into a right-handed screw sense. A 310-helical conformation of ambidextrous screw sense is established by X-ray diffraction. However, CD studies reveal that a right-handed 310-helical conformation dominate in solution. The preponderance of the right-handed 310-helical conformer is also confirmed using energy calculation studies [Additional file 1]. An unanticipated observation of ambidexterity of the peptide helices in the crystal structure demonstrates the influence of global interactions on the coexistence of left and right-handed helices in the crystal structure. This is a novel observation of a 310-helical dehydroundecapeptide mimicking interhelical interactions as seen amongst transmembrane helices. The crystallographic details of the peptide are given in (Table 1). Crystallographic studies suggest that, despite the presence of L-Ala and L-Leu residues in the sequence, the peptide has folded into two conformers in the crystal lattice, conformer A and conformer B (Figure 1). From the main chain conformation angles (Table 2) and the pattern of intramolecular hydrogen bonds (Table 3), it is clear that both right-handed as well as left-handed 310-helices are present in the crystal structure. The average (ϕ,ψ) values for 310- helical stretch (Ala2-Ala10) in conformer A are (54°, 24°), whereas the average (ϕ,ψ) values for this 310-helical stretch in conformer B are (-59°, -17°). The helices are stabilized by intrahelical 4→1 hydrogen bonds (Table 3). Interestingly the four (L) amino acid residues, Ala2, Leu4, Leu5 and Ala10 have taken the positive ϕ and ψ values corresponding to the left-handed 310-helical conformation in conformer A (Table 2). In 310-helices, every third residue would lie on the same face of the helix. 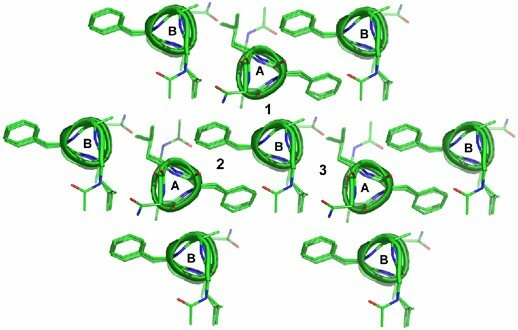 Consequently the side chains of the three ΔPhe residues in the undecapeptide, ΔPhe3, ΔPhe6, and ΔPhe9 are stacked on one face of the helix, residues Leu4, Leu7 and Ala10 lie on second face of the helix, while Ala2, Gly5 and Gly8 lie on third face of the helix. This arrangement of side chains creates a column of protuberant side chains at 120° to each other, resulting in the formation of grooves and wedges. The two helices A and B are antiparallel to each other. The angle between the two helical axes is 179°. It is observed that in crystal lattice the helix A is surrounded by three B helices, similarly helix B is surrounded by three A helices forming ΔPhe-ΔPhe, Leu-Leu and Gly-Gly helical interfaces (Figure 2). The closest approach Cα-Cα distances between the helices A and B at three interfaces was observed to be different; 5.9Å at the ΔPhe-ΔPhe interface, 3.9Å at the Gly-Gly interface and 5.4 Å at the Leu-Leu interface (calculated using computer program Helixang from CCP4 suite). Despite the closest approach of helices at the Gly-Gly interface as compared to Leu-Leu interface, energy calculation studies suggest that the Leu-Leu interface has the maximum stability followed by Gly-Gly and then ΔPhe-ΔPhe interface (Additional file 1). In the crystal lattice, the helices of similar handedness related by translation symmetry are observed as approximate helical rods aligned along z-axis. It is interesting to note that helices of same handedness pack one above the other and stabilize through head-to-tail kind of N-H...O hydrogen bonds; N2...O10', and N12...O1, while the tail to tail hydrogen bonding N12 (A)...O9' (B) is observed between the helices of opposite handedness  (Table 4). A notable feature in the crystal structure is that the two shape compliment helices A and B are interacting through extensive network of hydrogen bonds. At the Leu-Leu interface, helices A and B are involved in N-H...O hydrogen bond (Table 4). At the Gly-Gly interface the two conformers A and B are held together by five Cα-H...O hydrogen bonds all along the helical axis . These backbone (Cα-H) to backbone (carbonyl) hydrogen bonds observed between Cα(Ala2), Cα(Gly5), and Cα(Gly8) of conformer A to O8', O5' and O2' of conformer B respectively, and conversely Cα(Gly5) and Cα(Gly8) of Conformer B to O5' and O2' of conformer A respectively (Table 4), involve GXXG motifs from the two helices (Fig. 3a, Table 4). At the ΔPhe-ΔPhe interface, helices A and B are held together by symmetrically placed aromatic-backbone C-H...O hydrogen bonds distributed all along the helical axis . Hence C-H (Phenyl)...O (carbonyl) hydrogen bonds are observed between Cδ2 (ΔPhe3), Cδ2 (ΔPhe6) and Cδ2 (ΔPhe9) of conformer A to O6', O3' and O1 of conformer B correspondingly. Similarly C-H (Phenyl)...O (carbonyl) hydrogen bonds are observed between Cδ2 (ΔPhe3), Cδ2 (ΔPhe6) and Cδ2 (ΔPhe9) of conformer B to O6', O3' and O1 of conformer A respectively (Fig. 3b, Table 4). The coexistence of right and left-handed helices favored by the involvement of interhelical hydrogen bonds in the solid state may be presumably to optimize helix-helix interactions, suggesting that tertiary (global) interactions, including overall vander Waals, hydrophobic, electrostatic and hydrogen bond interactions can significantly influence even the local secondary structural features that involves amino acid residues close to each other in a peptide sequence. Glycine residues (Gly5, Gly7) here seems to act as surrogate D-amino acids by assuming left-handed helical conformation . In particular, the interaction motif which involves the occurrence of aromatic C-H..O hydrogen bonds and intercalation of aromatic side chains between adjacent and antiparallel 310-helices of opposite handedness is observed in other ΔPhe containing peptide crystal structures analyzed earlier in our laboratory [5, 17]. 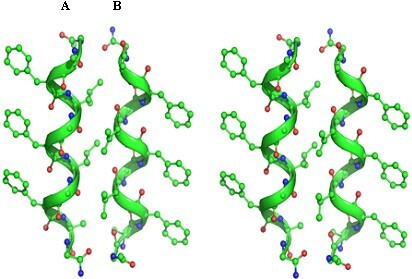 It seems that the two opposite handed helices in the crystal packing seen have utilized a similar interaction motif leading to their association with each other. Despite the presence of opposite handed helices, the present peptide is found to engage itself in extensive C-H...O hydrogen bonds. A remarkable feature of the present peptide is the observation of zipper like arrangement of multiple Cα-H...O hydrogen bonds consistently at three residue intervals at Gly-Gly interface, which may be termed as glycine zipper. The distance of 3.9Å between the adjacent helices at the Gly-Gly interface promotes packing interactions between the helices. This similar geometry for interhelical interaction is reportedly observed in transmembrane helical proteins between helices involving GXXXG like motifs. Although the four-residue spacing is strongly preferred over other possible Gly patterns, reinforcing the significance of the GXXXGXXXG sequence pattern. Nevertheless, other spacings could lead to glycine zipper packing if the Gly residues are placed on the same face of the helix. Thus, the glycine zipper face may act as a magnet for helix packing. Data collection and Refinement parameters for Ac-Gly-Ala-ΔPhe-Leu-Gly-ΔPhe-Leu-Gly-ΔPhe-Ala-Gly-NH2. Torsion angles (°) for peptide. Intrahelical hydrogen bonds observed in the crystal structure of Peptide Ac-Gly-Ala-ΔPhe-Leu-Gly-ΔPhe-Leu-Gly-ΔPhe-Ala-Gly-NH2. Intermolecular hydrogen bonds observed in the crystal structure of the peptide. Stereo view for the molecular conformation of the undeacapeptide. A denotes a left-handed 310-helix and B aright-handed 310 helix. The helices A and B are antiparallel to each other. Arrangement of helices in crystal packing. The figure shows the arrangement of helices as viewed down the helical axes. There are three interhelical interfaces viz. Gly-Gly (1), ΔPhe-ΔPhe (2) and Leu-Leu (3). Network of C-H...O hydrogen bonds at different interfaces. a) Stereo view for the network of Cα-H...O hydrogen bonds at Gly-Gly interface. The GXXG motif has promoted the close approach of opposite handed 310-helices there by encouraging the vander Waals and Cα-H...O interactions. b) Stereo view for the network of C-H...O hydrogen bonds at ΔPhe-ΔPhe interface. The peptide has three ΔPhe residues interspersed by two amino acid residues. The CD spectra display a negative couplet (-, +) in acetonitrile, chloroform and trifluoroethanol. A negative band is observed at about 295 nm and an intense positive band at about 265 nm, with a crossover point at ~280 nm (Figure 4). This CD pattern corresponds to the absorption maximum at 270–280 nm and arises from the dipole-dipole interactions between the charge transfer electronic moments of the two dehydroamino acid chromophores placed in a mutual fixed disposition within the molecule. This pattern as reported earlier, is typical of a right-handed 310-helix [13, 28]. The varying intensity of bands in different solvents suggests different content of the 310-helical conformer. 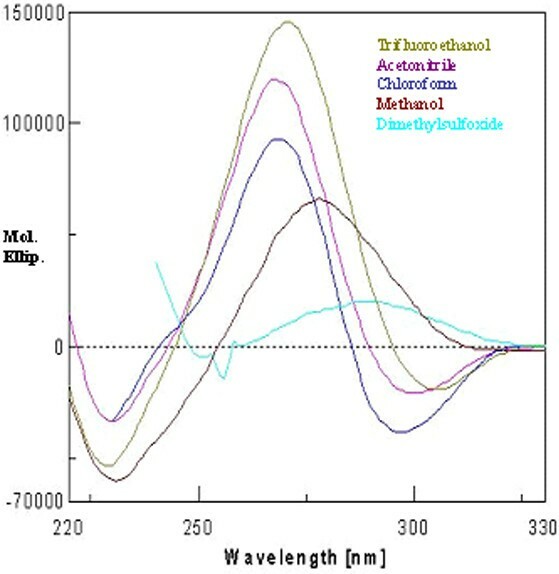 In methanol, the spectrum shows a positive band at about 280 nm. This could be possible when the styryl side chains of dehydroresidues are placed on the opposite sides of the helix. 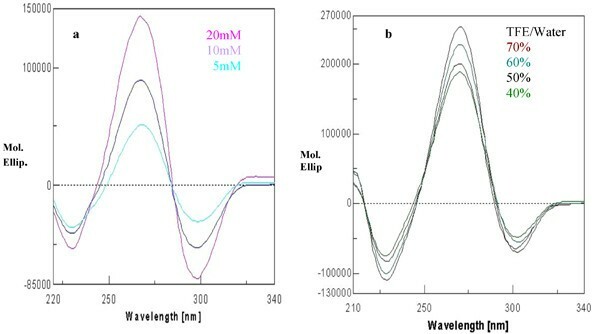 In this arrangement, no exciton splitting will be observed, and the positive band at 280 nm arises from the contributions of the noninteracting but chirally perturbed chromophores. The very low intensity of bands in the CD spectrum in methanol may be attributed to the polarity of the solvent. It is known that folded peptide structures with stabilizing hydrogen bonds are more stable in apolar solvents than in polar ones. The peptide is found to preferentially form a right-handed 310-helical conformer. The difference between X-ray and CD interpretation may arise due to conformational heterogeneity in the solid state that can lead to crystallization of a minor conformer, driven by favorable packing interactions. On the other hand, the solution studies largely monitor the major species present in solution. The stabilization of right-handed conformer over the left-handed 310-helical conformer is also confirmed using energy calculation studies (Additional file 1). The CHCl3-MeOH titrations revealed a surprising but interesting observation. At a concentration of 50:50 (chloroform: methanol), not only the right-handed 310-helical structure is observed but there is also a steep rise in the molar ellipticity value (Figure 5). It is possible that an equal mixture of a polar (methanol) and an apolar (chloroform) solvent provided some kind of amphiphilic environment to the peptide, leading to enhanced stabilization of the structure as compared to that in chloroform alone. Following the above observation, the experiments were performed in different lipomimetic solvents such as aqueous SDS and aqueous TFE mixture. CD spectra of the undecapeptide in SDS and TFE/water solution show intense exciton-coupled band, characteristic of a right-handed 310-helical conformer. Though the peptide was completely insoluble in water but it was soluble in different percentages of SDS/water and TFE/water (Figure 6a). Thus the peptide is found to attain more stability in a membranous environment. 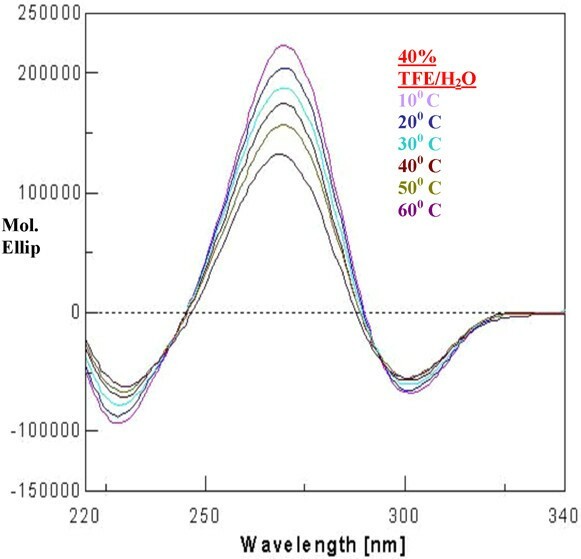 The band intensity in TFE/water (40–70%) decreased with the decrease in the percentage of TFE (Figure 6b) and increase in the water content, which is deleterious for dehydrophenylalanine containing structured peptides. However the decrease in band intensity does not reflect in any conformational change of the present peptide even at 40% TFE/water, suggesting the overall stability of the peptide in a membranous environment, provided by TFE/water mixture. Variable temperature studies in 40% TFE/water show maximum stability at 10°C, suggesting the effect of lowering the temperature on the stability of the structure (Figure 7). The explanation for the above observation could be a result of TFE reinforcing hydrogen bonds between carbonyl and amidic NH groups by the removal of water molecules in the proximity of the solute and lowering the dielectric constant of the surrounding milieu [29, 30]. Thus the peptide attains more stability in membrane mimetics at relatively low percentage, suggesting the propensity of the peptide to exist in an ordered 310-helical conformation in a hydrophobic environment and depicting stabilization achieved by molecular association . CD spectrum in different solvents. Chloroform-methanol titration depicting maximum intensity at 50: 50 CHCl3: MeOH. 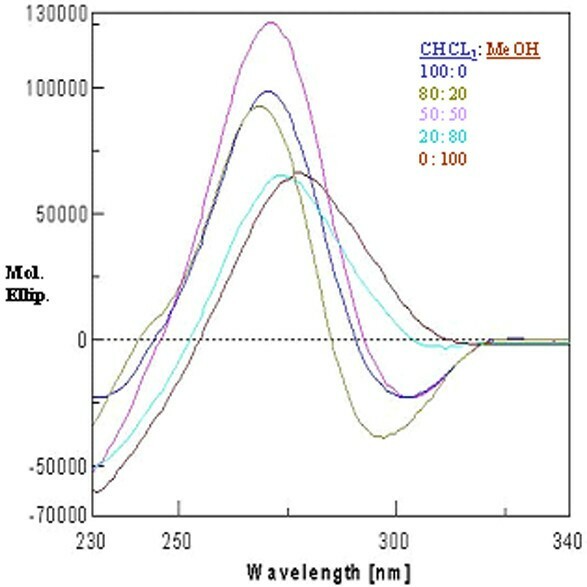 CD spectra in different lipomimetic solvents. (a) Different concentrations of SDS-water. (b) Different percentage of aqueous TFE. VT-CD spectrum. CD spectra in 40% TFE/water as a function of different temperatures. The present peptide, Ac-Gly-Ala-ΔPhe-Leu-Gly-ΔPhe-Leu-Gly-ΔPhe-Ala-Gly-NH2, provides the first example of stability and compaction in interacting helices when glycine residues are incorporated in the middle of the peptide sequence. The incorporation of glycines in the form of GXXG motif along with ΔPhe residue at two-residue spacer has helped in maintaining the 310-helical conformation in both solid as well as solution state. The amalgamation of GxxG motif has not only facilitated the helices to come close at the Gly-Gly interhelical interface but also promoted the formation of glyzine zipper, where a zipper like arrangement of Cα-H...O hydrogen bonds is observed. The occurrence of weak C-H...O hydrogen bonds at ΔPhe-ΔPhe interface along with occurrence of main chain to main chain Cα-H...O hydrogen bonds consistently at three residue intervals at Gly-Gly helical interface involving GXXG motifs seems to impart molecular association and stabilization to the interacting helices. The phenomenon of molecular association leading to stabilization of the 310-helical conformer is also confirmed by the solution state study. The present design can encourage the peptide designers in pursuing the ambitious goal of de novo design of helical bundles of higher order and compaction utilizing ΔPhe residues along with GXXG motifs. Fmoc-protected amino acids for solid-phase peptide synthesis were obtained from Novabiochem. The undecapeptide was synthesized manually at a 0.5 mmol scale. Fmoc-Rinkamide MBHA resin (Novabiochem) (0.5 mmol/g) was used to afford carboxyl-terminal primary amide. Couplings were performed by using carbodiimide. The ΔPhe residue was introduced by dehydration of Fmoc-aa-DL-threo-β-Phenyl Serine (AA = glycine or alanine) using fused sodium acetate and freshly distilled acetic anhydride as reported earlier . All reactions were monitored by TLC on precoated silica plates in 9:1 CHCl3-MeOH system. The physical characterization of the dipeptide synthons is given as follows: Fmoc-Gly-DL-Phe (β-OH)-OH: Yield = 91.4%, m.p. = 72–74°C, Rf = 0.40, Fmoc-Gly-ΔPhe-Azlactone: 93%, 102–104°C, 0.95, Fmoc-Ala-DL-Phe (β-OH)-OH: 90%, 112–115°C, 0.3, Fmoc-Ala-ΔPhe-Azlactone: 91%, 142–145°C, 0.7. All the couplings were followed by a five-minute reaction with acetic anhydride and HOBT in DMF/DCM to cap any unreacted amines. Fmoc deprotection was performed with piperidine (20% in DMF). After addition of the final residue, the amino terminus was acetyl-capped and the resin was rinsed with DMF/DCM/MeOH and dried. The final peptide deprotection and cleavage from the resin was achieved with 10 ml of 95:2.5:2.5 TFA: H2O: triisopropylsilane for two hours. The crude peptide was precipitated with cold ether, lyophilized and purified by preparative reverse phase HPLC. The crude peptide was purified by RP-HPLC using water-acetonitrile gradient on Waters Deltapak C18 (19 mm × 300 mm). A linear gradient of acetonitrile from 10% to 70% over 60 mins at a flow rate of 6 ml/min was employed. The purified fractions were pooled, lyophilized and stored at -20°C as dry powder. RP-HPLC spectrum of the peptide is given (Figure 8). Retention time: 41.5 mins. 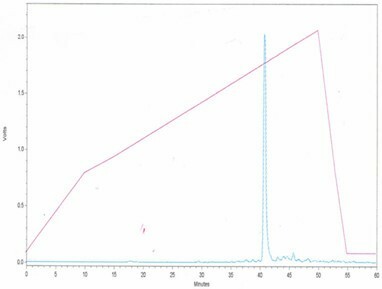 Peptide identity was confirmed by mass spectrometer, C55 H70 N12 O12, calculated mass 1091da, observed mass 1114 Da (sodium peak), melting point: 160–165°C. The peptide crystals were grown by the slow evaporation of peptide solution (1:1 v/v) in ethanol and acetone mixture. The X-ray diffraction data was collected using a suitable crystal cryo cooled to 100 K in synchrotron radiation source, at beam line X9A, Brookhaven National Laboratory. The structure was solved by direct method using SHELXS and was refined using full matrix least square refinement employed in SHELXL . The hydrogen atoms were fixed using stereochemical criteria and were allowed to ride on parent atoms. The crystallographic data of the present peptide is deposited in CCDC (CCDC289231). CD spectra were recorded on a JASCO J-720 CD spectropolarimeter. The spectra were acquired between 220–330 nm (0.1 cm cell, peptide concentration ~100 μM) at 0.1 nm intervals with a time constant of 4 seconds and a scan speed of 200 nm/min and averaged over 6 separate scans. The spectra obtained were baseline corrected and smoothed. Peptide concentration was determined using the molar extinction coefficient of ΔPhe (~19,000 M-1cm-1). CHCl3-methanol titration was carried out. CD spectra were recorded at different concentrations of SDS and also at different percentage of TFE/water. The CD spectra were recorded in 40% TFE/water at variable temperatures. The energy minimization for the present peptide was performed using the SYBYL software package (version 7.0) (1). The force field used was AMBER7 FF99 implemented in SYBYL. The convergence criterion of 0.05 kcal/mol (Å) as well as the non-bonded cut-off distance was set to 8Å. The partial charges on protein residues were AMBER7 F99 all-atom charges. A value of 1 was set out for dielectric constant for these peptides. The details of energy calculation values are given as additional file 2. The financial support from the Department of Science and Technology, India is acknowledged. The financial support from WHO, is also acknowledged. We would like to thank Prof. Faizan Ahmad at Jamia Millia Islamia for his consent in using the Circular Dichroism facility in his laboratory. We thank department of Biotechnology, India for access to facilities at Bioinformatics and interactive graphics facility, I.I.Sc, Bangalore. RA would like to thank IBM-CAS fellowship. RA solved the crystal structure of the peptide, carried out energy calculation studies, analysis and interpretation of crystal data. MG carried out the peptide synthesis, purification and characterization, acquired the CD spectra and performed the analysis of the CD data. UAR collected and processed the synchrotron diffraction data for the crystal. RA, MG, SR, and VSC conceived of the study, and participated in its design and coordination and helped to draft the manuscript. All authors read and approved the final manuscript.